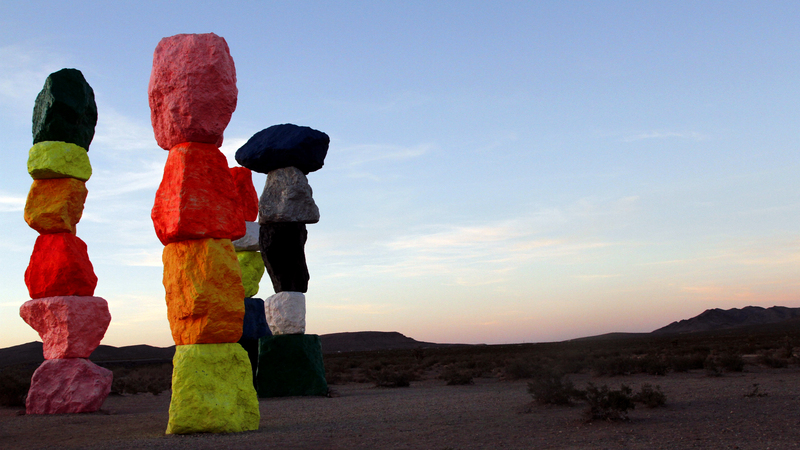 A magical, hyper-charged oasis in the middle of the desert, and not for the faint of heart. Neon lights dominate the skyscape of this 24-hour metropolis. It’s the home of showgirls and casinos, strip clubs and nightclubs, fantasies and regrets. 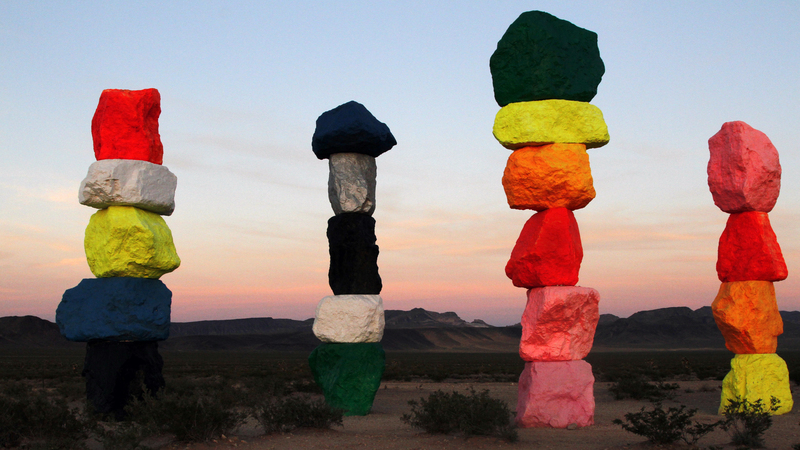 Without a doubt, Vegas’s geography contributes to its magnetism. The desert is a bewitching place. 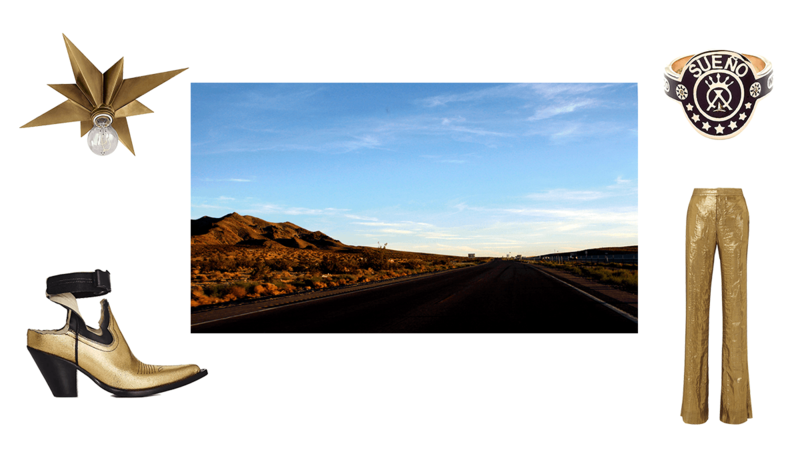 Vibrant sunsets coupled with dazzling desert views bring a certain divinity to a city mostly known for its debauchery. ﻿When you see our logo +, click to shop. A STARBURST LIGHT FIXTURE HAS A CABARET VIBE. MARGIELA'S GOLD-AND-BLACK TAKE ON THE COWBOY BOOT IS A NOD TO THE OPULENT WESTERN CITY. FOUNDRAE'S CIGAR BAND RING IS A NO-RULES REMINDER IN A TOWN WHERE INDULGENCE IS A TOP PRIORITY. DEREK LAM TROUSERS CUT IN A FABRIC BORN TO PARTY ALL NIGHT LONG. LAS VEGAS WAS THE INSPIRATION FOR JEREMY SCOTT'S RESORT 2018 COLLECTION FOR MOSCHINO. HERE, SHOP A CLASSIC BLACK SLIP DRESS PUNCTUATED PERFECTLY WITH A PINUP GIRL. 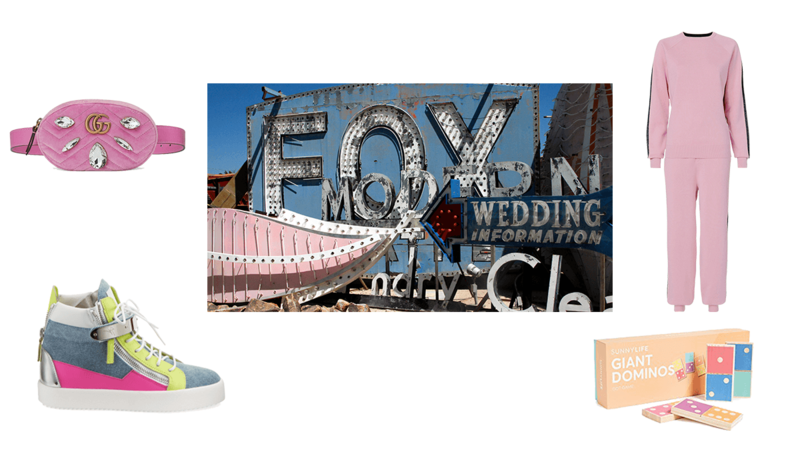 CRYSTAL-EMBELLISHED PUMPS MIMIC THE MULTI-COLORED ART INSTALLATION "SEVEN MAGIC MOUNTAINS" JUST 10 MILES SOUTH OF THE STRIP. 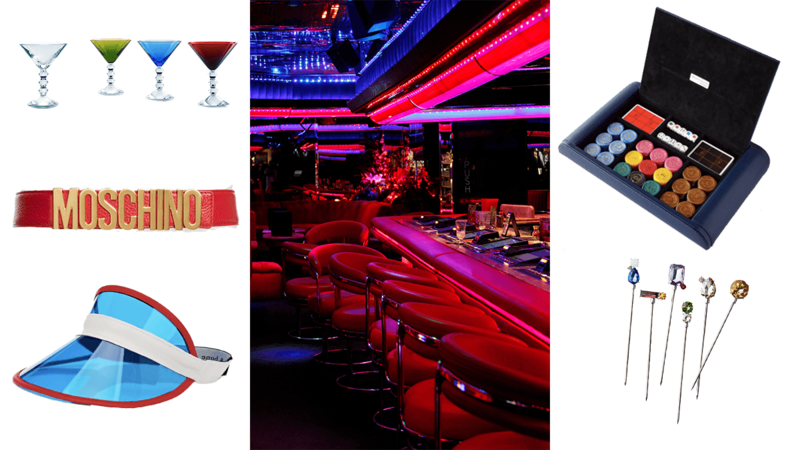 LET A BLINGED-OUT PHONE CASE BE YOUR CASINO COMPANION. THIS COLORFUL COVER IN RETRO POWDER PINK IS ADORNED with appliqués reminiscent of the neon-signed city. 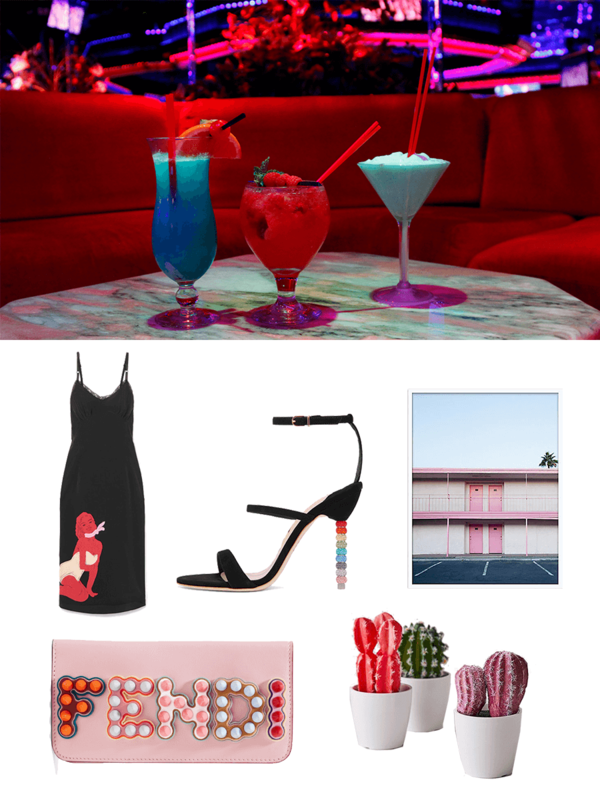 add a trio of cacti in colors as offbeat as the town's clientele. A FRAMED PHOTO PRINT CAPTURES A VACANT MOTEL AMIDST A TOWN OF TOURISTS. BREATHE DESERT STYLE INTO YOUR SPACE WITH THE REGION'S SIGNATURE SUCCULENT. 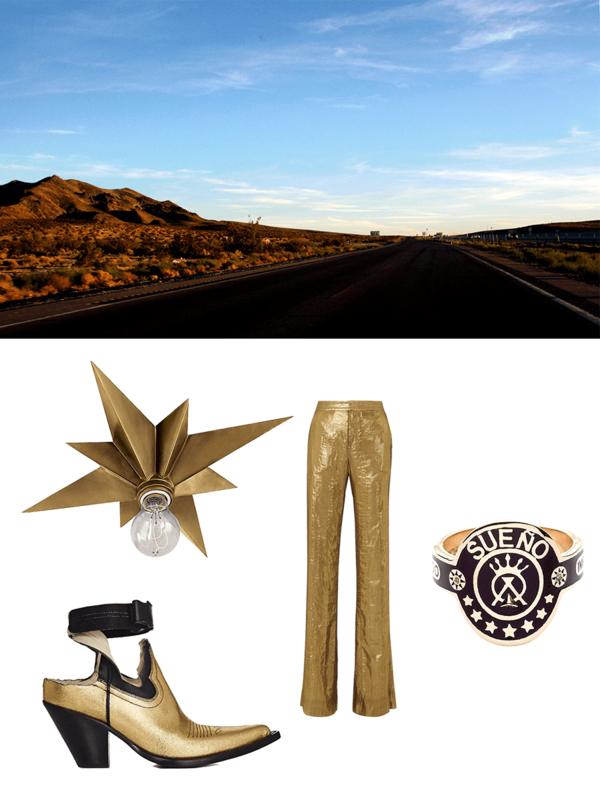 MAKE LIKE A SHOWGIRL AND COVER ARMS AND LEGS IN GOLD GLITTER FOR A NIGHT ON THE TOWN. 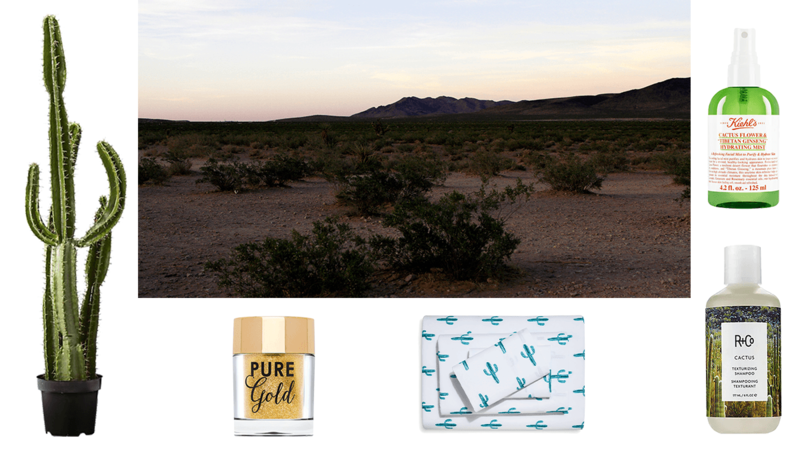 A SWEET CACTUS MOTIF COVERS SHEETS SOFT ENOUGH TO SINK INTO. 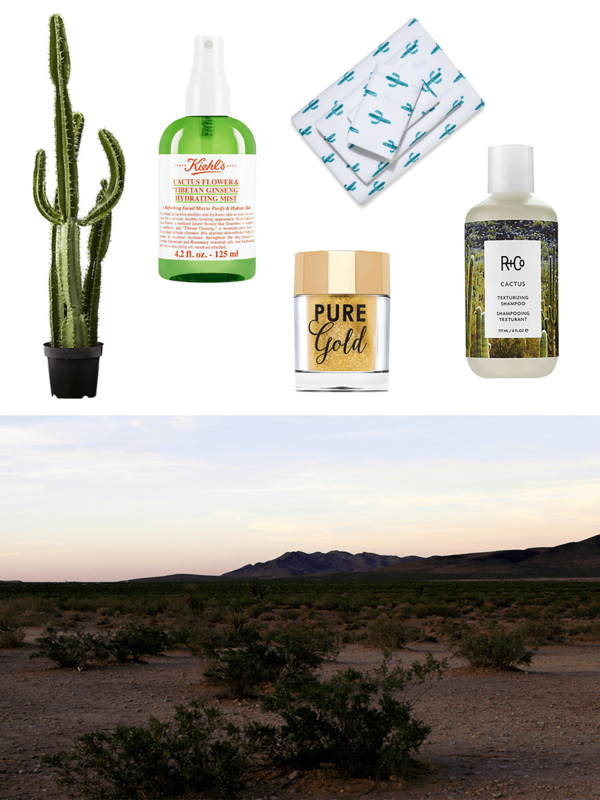 ESSENTIAL FATTY ACIDS FOUND IN CACTUS NOURISH THE HAIR AND FACE IN EVEN THE DRYEST OF CONDITIONS. 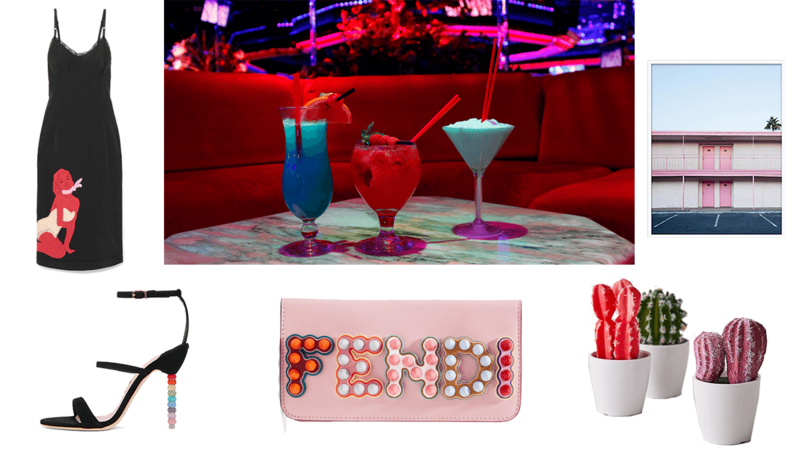 WHEN YOU'RE OUT ALL NIGHT LONG IN A CITY THAT NEVER SLEEPS, A FANNY PACK IS AN ESSENTIAL—CRYSTALS AND VELVET MATCH THE MOOD. 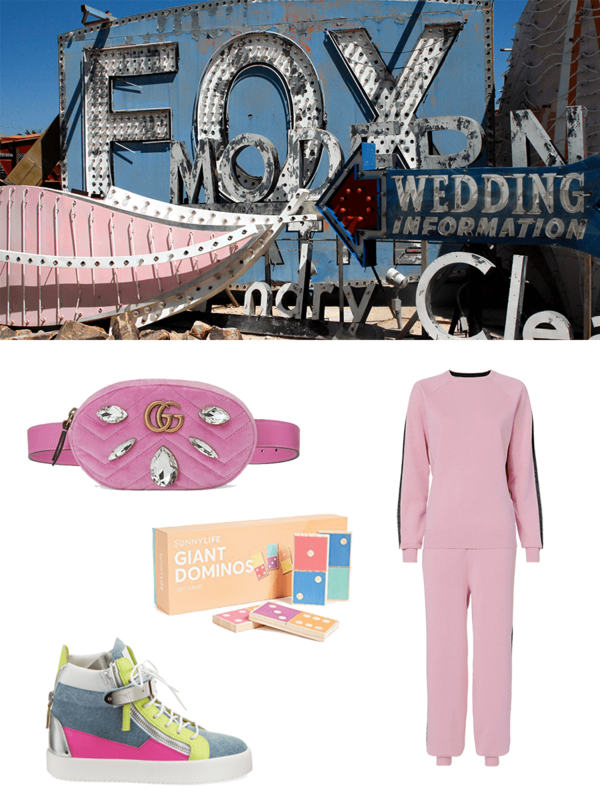 LAID-BACK LUXE: BROWSE ICONIC SIGNS AT THE NEON MUSUEM IN A DRESSED-UP SNEAKER AND TRACKSUIT. TAKE THE STAKES TO YOUR SUITE WITH A SUPER-SIZED GAME OF DOMINOS. SIP FROM ONLY THE FINEST IN BACCARAT'S COLORFUL CRYSTAL MARTINI GLASSES. IN A LAND THAT LOVES LOGOS, MOSCHINO'S BELT IS A CLASSIC. GET SERIOUS ABOUT THE GAME (AND SHIELDING FROM RAYS) IN RAG & BONE'S leather-trimmed VISOR. 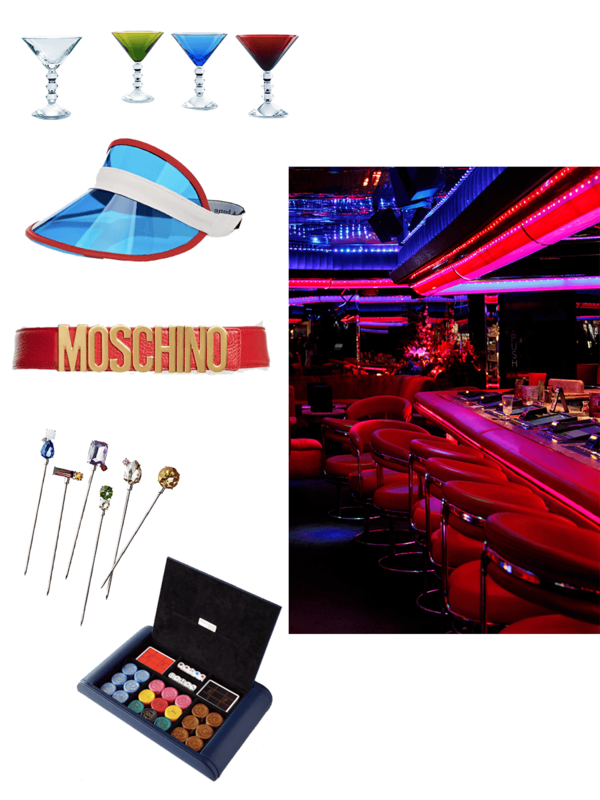 a PLAYFUL PRESENT ALLOWS FOR A PORTABLE POKER PARTY. UNEXPECTED TWIST: DECORATE GUESTS' COCKTAILS WITH STONES THAT SHIMMER. ALL SIGNS POINT WEST. ACCENT YOUR WALL WITH BOLD BULBS TO BOOST THE ATMOSPHERE. 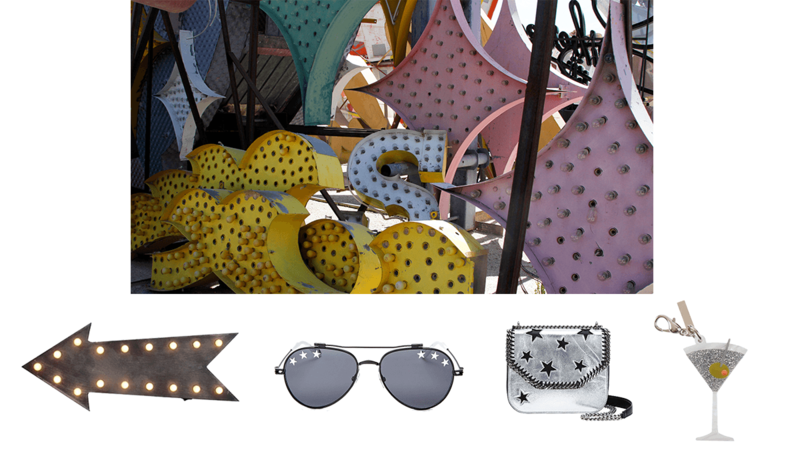 LOOK LIKE A MILLION BUCKS IN GIVENCHY'S WHITE HOT, STAR-STYLED SUNNIES. 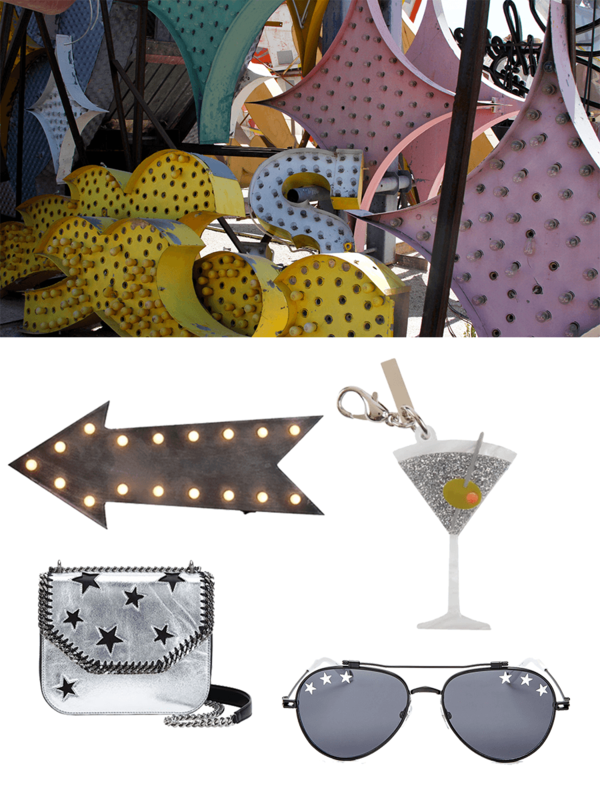 GO ALL OUT WITH YOUR LOOK: MARTINIS AND METALLICS CREATE A MAGNIFICENT MOMENT—JUST ADD AN LBD.